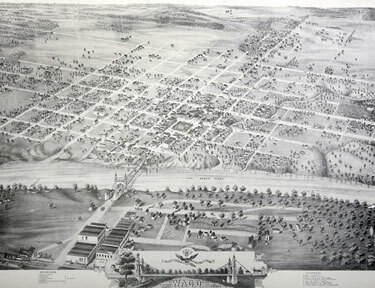 This is a drawing of Waco in 1873. Mouse over the photo to see how fast it grew in 13 short years. Question: What major change might have caused this growth? Visit the Ammon Carter Museum Web site to see more bird's eye view of old Waco by clicking here. TexasScapes is a good web site for old photos of Waco and various Texas landscapes.